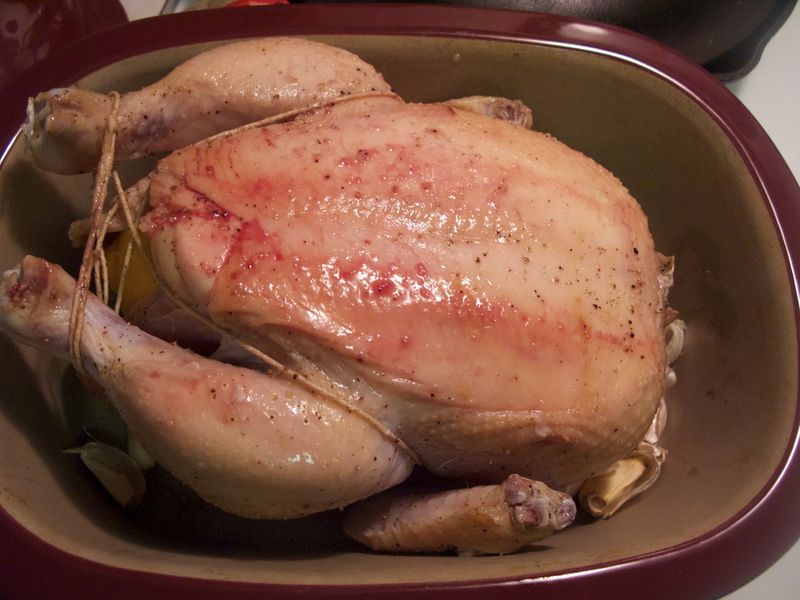 Kitchen Basics: How to Roast and Carve a Chicken. I used to look at the packaged whole chickens and wonder, 'what in the world do I even do with that?' Never mind that I had no idea how to cook it, they were usually way too much meat for my family, even taking into account that the weight of the bones were factored into total poundage. Anyway, I figured, why pay for bones when I can just buy boneless skinless chicken breasts? I have since learned that bones lend flavor, and they make wonderful stock. (More on that in another post.) What's more, one chicken doesn't just feed my family for one night, it often lasts through three nights of meals, if I don't make chicken noodle soup, and if I do, it's even more! It's worth the investment, and, frankly, it's just plain tasty. Don't be intimidated by raw meat. I hate touching raw meat, but I can get through this, and relatively quickly too, when I don't stop for photos. :) Some chickens come 'with giblets' and sometimes other parts, depending on how who packaged them labels it. I prefer the ones that are sold without, simply because it's less work, and I don't have to dig for a plastic bag inside a chicken. There's only so much I set out to do when making dinner, after all. It's up to you, of course, what you choose, but check the package before you delve into this, just to be sure. You don't want to accidentally bake a plastic bag inside your lovely chicken dinner. Fill a small bowl with salt and pepper, set aside. Roll the lemon, or lemons, if you have two small ones, on the counter to soften them up a bit. Stab the lemon(s) all over with a knife, fork, or other sharp implement at least twenty times. Take your chicken out of its package. Make sure to check if it comes with giblets/extra parts or not. Mine did not, but I checked anyway, in case of mislabeling. Take off any extra bits of fat, feathers, or anything else that doesn't seem that it should belong. Be smarter than me and move your sponge before getting the chicken near it. (We changed sponges after these pictures.) Rinse chicken. Some people say you don't need to rinse chicken anymore, but I usually do, mainly to make sure the inside of the chicken is fully thawed before roasting, for even cooking. Also, if giblets are included, and my bird has been frozen, this is usually the only way I can get them out. Rub salt and pepper all over your bird. You can add other seasonings as well, if you like. Fresh rosemary is especially nice. The simplicity of plain salt and pepper sometimes just can't be beat though. When you think you've put enough salt and pepper, put a bit more. Don't forget to get the underside of your bird as well. Get lots of salt and pepper inside too. Wedge the lemon or lemons inside the chicken. Cut a long length of twine or floss, longer than you think you'll need. (I didn't cut mine long enough and had to try again. ) Tie legs loosely together. I'm not going to lie, I'm no master at this, but as long as the string stays mostly attached, it'll be okay. Pull a bit taut, enough that you don't have to worry about the lemon(s) popping out while cooking. Hook under the wings and neck and tie where the strings meet together. Place in baking pan breast side down. I threw in some garlic cloves around the chicken as a last minute treat. (If you leave the peel on, you can find them after it's all roasted. If you peel them, they melt into the sauce.) Place in oven and roast for 30 minutes. You don't need to baste it or add any fat or oil to the pan. The chicken won't stick; thanks to the lemon it's self-basting. Grab some meat tongs, forks, or anything you think you can lift the chicken with and not burn yourself. lip the chicken so that the breast side is facing up. Don't be freaked out, it may be a little bloody and ugly at this point. Roast for another 30 to 35 minutes, then turn the oven up to 400ºF. Roast for another 20 to 25 minutes, or until the chicken reaches at least 165ºF with a meat thermometer that is NOT touching the bone. You can calculate about 20 minutes of cook time per pound of chicken to figure out total time. Don't be afraid to leave it in the oven longer if it doesn't seem quite ready. 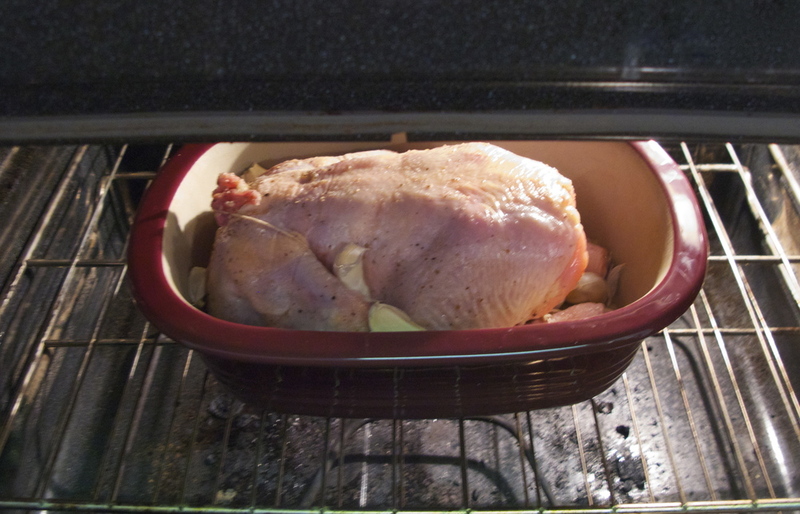 nce the chicken passes the meat thermometer test, take it out of the oven. Don't squish the lemon!!! The juice inside is VERY hot! Take the chicken out and set it on a large cutting board. You don't necessarily need not this big, but the extra space is nice. If possible, use a cutting board with a bit of a rim to catch juices. To carve your chicken, use a fork to pull a leg to the side and slice through the skin near the joint. Once you slice in far enough to see the joint, place the tip of your blade in the joint and cut through. this will be difficult at first, but be careful not to cut through the bone itself. (I've done that, I did it with this bird, in fact, on another joint. It makes more work, and it's not as nice looking.) Repeat with the other leg. Find the joint where the thigh connects and cut through the joint there on both legs. Place your fork as near to the breastbone as you can and slice down, close to the bone, until you run into ribs, then slice outwards until the breast is free. Repeat on the other side. Again, don't poke the lemon! Here's all the carved pieces. You're nearly done! Make sure you clean the meat off the remaining bones after they've cooled. There's still a fair amount of meat there that can be used in casseroles, tacos, soup, chicken salad, or whatever else you can think of.. Don't throw the bones away either. Those will make great stock. If you're not ready for that undertaking quite yet, throw the bones in a gallon freezer bag and save them for when you've got a free afternoon. There'll be a post coming soon about how to make chicken stock. Now, go and enjoy your lovely roasted chicken! Fill a small bowl with salt and pepper. Roll lemon(s) on counter to soften, then stab all over with a sharp knife, fork or other implement. Cut a very long length of twine or floss. Put the chicken in the pan, breasts facing down. Don't add cooking fat of any kind, its not needed. The bird is self basting and will not stick. Roast for 30 minutes, then turn the bird over, breasts facing up. Roast for another 30 to 35 minutes, then turn the heat up to 400ºF. Roast for another 20 minutes. Calculate about 20 minutes of time per pound of chicken for the total cooking time. 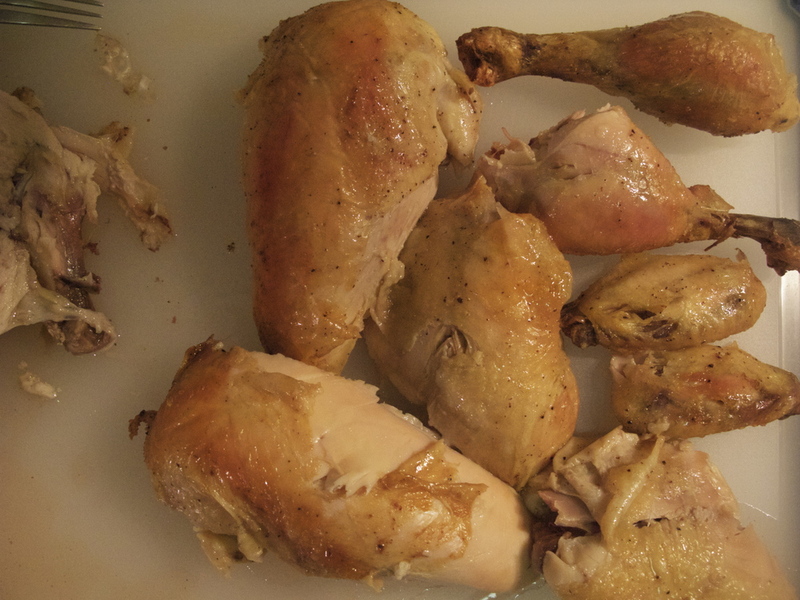 When the chicken has reached 165ºF by a meat thermometer not touching a bone, the chicken is done. Separate the chicken pieces at each joint, by cutting through the joints rather than the bones. Set aside bones for making stock, and any leftover chicken for another meal. Enjoy!